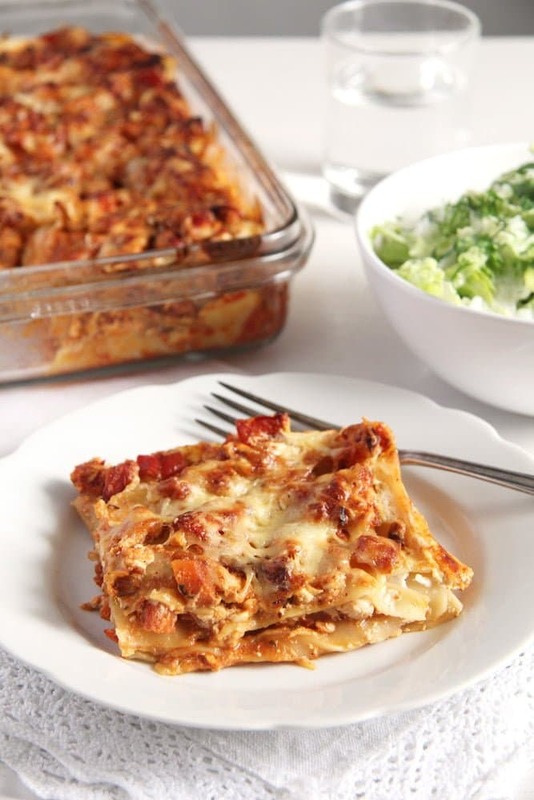 A delicious light lasagna with leftover turkey, vegetables and a skinny cream cheese and cottage cheese sauce. I used to make this cream cheese lasagna many years ago, using this delicious and healthy cream cheese and cottage cheese sauce. During those times it was mostly vegetarian with lots of different veggies like carrots, peppers, broccoli and even kohlrabi once. But then, like with many recipes we love at one point or another, we kind of forgot about it. 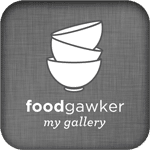 Recently, while perusing one of my first recipe notebooks I found the recipe again and thought it would be a great idea to make it again and this time to put some turkey into it as well. With so many turkey roasts lately (have a look at this delicious Oven Roasted Turkey Breast or these Oven Roasted Turkey Drumsticks), I did find myself with lots of turkey leftovers in the fridge. The Quick Fricassee with Leftover Turkey and Mushrooms and the Yufka Rolls with Chestnuts, Turkey and Herbs were wonderful, but more recipes were needed. After several turkey sandwiches, which were all delicious but not particularly special and a couple of turkey salads, I was left with two more recipes I really wanted to try: a turkey pilaf with Brussels sprouts and thiscream cheese lasagna with leftover turkey. I cooked and photographed both dishes and we thoroughly enjoyed both of them, but in the end I decided to post the lasagna. I really hope some of you out there will give this cream cheese lasagna a try, it is really worth it! And unlike most lasagna recipes, it will really not leave you with a guilty conscience. After all the Thanksgiving or Christmas indulgence, I always find myself in need of some thoroughly healthy recipes and this lasagna fulfils this goal perfectly. 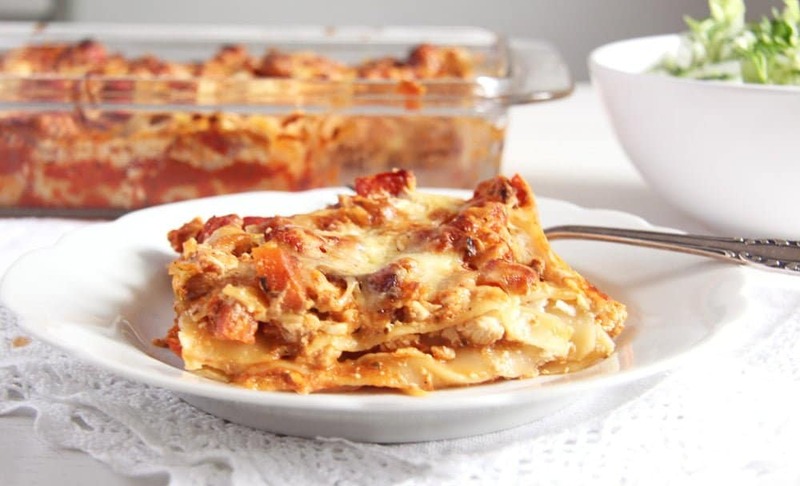 And best of all, you will not even be able to taste its being sooo healthy, it tastes just like a regular, calorie-loaded lasagna, maybe a tad sharper than your regular Bechamel sauce lasagna, but so delicious you will make it again and again. I used leftover turkey to make this cream cheese lasagna. If you don’t have leftovers, use fresh turkey strips which you will fry in 1 teaspoon olive oil and season with salt and pepper. I used homemade pizza sauce which I had in the freezer. That was basically 1 lbs pureed tomatoes mixed with salt and pepper, a pinch of sugar, dry oregano and dry basil. To make that mixture could not be easier or cheaper, but if you wish you can use any pizza or tomato pasta sauce brand you like. I used low fat cream cheese 4% fat, low-fat cottage cheese 0,2% fat, low-fat milk and sour cream 10% fat. 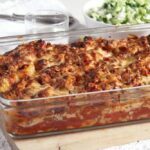 You can use that or higher fat versions, that is definitely up to you, but if you have been looking for a low-fat, healthier lasagna, then you will probably be interested in using the low-fat products. In Germany we use uncooked oven ready lasagna sheets. However, I have seen many American recipes where one is supposed to cook the lasagna sheets prior to layering the lasagna. Please read the lasagna packet’s instructions and use the lasagna sheets accordingly. If you are using leftover turkey chop it into very small pieces. If you are using fresh turkey, chop it, season it with salt and pepper and fry it in 1 teaspoon olive oil until golden. Take out of the pan and set aside. Slice the onion into thin half rings. Chop the garlic finely. Chop the carrots and the bell pepper into small cubes. Heat one teaspoon olive oil in the pan, add the onion rings and cook shortly until translucent. Add the garlic and the carrots. Cook stirring often for about 2 minutes, add the peppers and cook for another 2 minutes. (I normally chop the peppers while the carrots are in the pan and add them as soon as I am finished chopping them). Add about 75 ml/ 1/3 cup water, salt and pepper to taste and some dry oregano. Cover leaving a crack open and cook the vegetables for about 10 minutes or until a bit softer. Add the pizza or tomato sauce and heat again. In the meantime preheat the oven to 200 degrees Celsius/ 400 degrees Fahrenheit. Whisk together the cream cheese, milk and sour cream. Set aside. When the tomato sauce is warm, add the cottage cheese and the finely chopped turkey to the sauce and stir well. 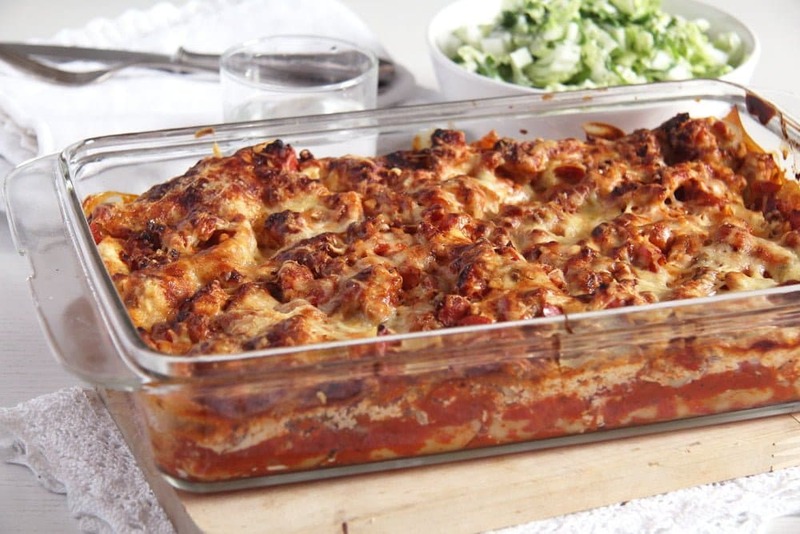 Give a few tablespoons of the tomato-vegetable-turkey sauce to a rectangular casserole dish (ca 20x30 cm/ 8-12 inches). Arrange 3 lasagna sheets on top, cover with some cheese sauce and some tomato sauce again. Add the following 3 lasagna sheets, some cheese sauce and then tomato sauce. Place the last 3 lasagna sheets on top and finish with the remaining cheese sauce, followed by the remaining tomato sauce. Spread the grated Gouda and Parmesan on top. Bake for about 35-40 minutes or until the noodles are cooked through. 1. I used homemade pizza sauce which I had in the freezer. That was basically 1 lbs pureed tomatoes mixed with salt and pepper, a pinch of sugar, dry oregano and dry basil. To make that mixture could not be easier or cheaper, but if you wish you can use any pizza or tomato pasta sauce brand you like. 2. In Germany we use no precook, oven ready lasagna sheets. However, I have seen many American recipes where one is supposed to cook the lasagna sheets prior to layering the lasagna. Please read the lasagna packet's instructions and use the lasagna sheets accordingly. Lots of cream and cheese…it must be very delicious! This is the perfect dinner for my family. We love baked pastas and my husband isn’t a huge fan of ricotta so the cottage cheese is perfect. 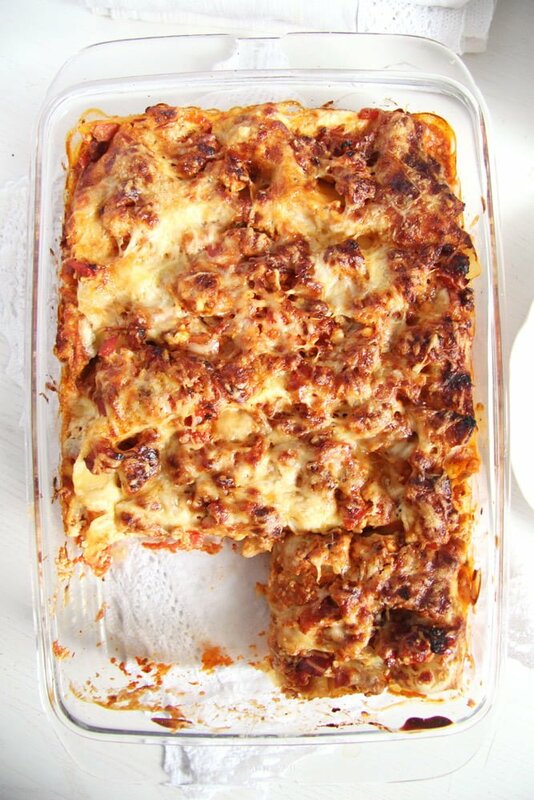 i’ve never tried cream cheese in my lasagna–great idea!